Seattle Gay Blog: Passion Pit interviews for "Best of Music 2009"
Passion Pit interviews for "Best of Music 2009"
Electro-pop quintet Passion Pit, whose song "Sleepyhead' is heard on the new Palm Pixi television commercial, has interviewed with Seattle Gay News. Band members Nate Donmoyer and Ian Hultquist are featured in a centerpiece interview for our Best of Music 2009 issue, out tomorrow. The pair disclose their favorite music of 2009, their plans for New Year's Eve, and tell us which fellow group member recycles his underwear while on tour (yes, we went there). Find out tomorrow which Albums, Singles, Live Performances, and Hottest Artists made our Top Ten lists for the past twelve months, as well as our unfortunate Worst roster of shame. 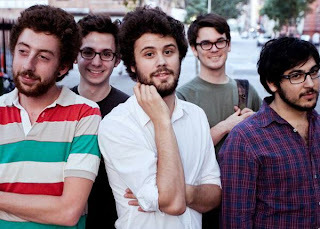 And get familiar with up and coming stars Passion Pit. Celebrate the year that was on December 18, the Best of Music 2009.